We’d love your help. Let us know what’s wrong with this preview of Gringo by Chesa Boudin. Gringo charts two journeys, both of which began a decade ago. The first is the sweeping transformation of Latin American politics that started with Hugo Chávez's inauguration as president of Venezuela in 1999. In that same year, an eighteen-year-old Chesa Boudin leaves his middle-class Chicago life -- which is punctuated by prison visits to his parents, who were incarcerat Gringo charts two journeys, both of which began a decade ago. The first is the sweeping transformation of Latin American politics that started with Hugo Chávez's inauguration as president of Venezuela in 1999. In that same year, an eighteen-year-old Chesa Boudin leaves his middle-class Chicago life -- which is punctuated by prison visits to his parents, who were incarcerated when he was fourteen months old for their role in a politically motivated bank truck robbery -- and arrives in Guatemala. He finds a world where disparities of wealth are even more pronounced and where social change is not confined to classroom or dinner-table conversations, but instead takes place in the streets. To ask other readers questions about Gringo, please sign up. Stay away from this mundanely written snoozefest. This is a very important book because it gives a first hand view in multiple countries of the destructive effects of the neoliberal policies effects on the countries he visited and writes about including Guatemala, Brazil, Bolivia, Ecuador, Venezuela, Chili, Argentina. The fact that none other than Howard Zinn, Noam Chomsky and Greg Grandin wrote notes goes to illustrate the importance of this book. After reading a review of this book on The Tenured Radical, I was excited to receive it as a graduation gift from family friends. The book offers a rundown on the contemporary politics of Latin America in the guise of a travel narrative. There is an earnest tone to this book. The author is willing to admit his faults, and be upfront about the contradictions about his privileged traveling through Latin America where he happened to be just about every place that made headlines in the U.S. at the ti After reading a review of this book on The Tenured Radical, I was excited to receive it as a graduation gift from family friends. 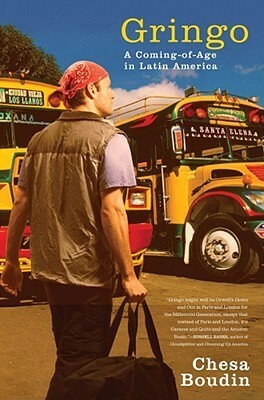 The book offers a rundown on the contemporary politics of Latin America in the guise of a travel narrative. There is an earnest tone to this book. The author is willing to admit his faults, and be upfront about the contradictions about his privileged traveling through Latin America where he happened to be just about every place that made headlines in the U.S. at the time of the headline making. He comes across a likeable sort of fellow. The character he narrates is supposed to be one we can relate to, even across political differences as he struggles with his Spanish phrase book and gains a variety of girlfriends. He draws attentions to his contradictions rather than hiding them, justifying them, or apologizing for them. I was disappointed by how much I didn’t learn about Latin America in this book. I have what I consider basic knowledge of Latin America. I was prepared to be enlightened. Instead, I felt I was gaining more of a refresher of events I had already heard about than learning something new. This book too often read as a hit list of the past decade's headlines. If you don’t know much about contemporary Latin America, or you just want to be reminded of what you should be expected to know, you’ll probably enjoy this book. The author knows his subject and is able to write about it in a simple and engaging manner. Of course, these days, the headline behind the book is probably the author’s parents. His biological parents are political prisoners involved with the Weather Underground: his father still in jail. He was raised by Bill Ayers and Bernadine Dohrn. The author touches upon this heritage as well, perhaps just enough to buoy sales of the book? That may not be fair though. He also ponders in print the way his claim to a family fighting U.S. imperialism changes his avenues of access in the U.S. and shapes the way he thinks about the oppression faced by others. Another serendipitous find when picking up River of Darkness: Francisco Orellana's Legendary Voyage of Death and Discovery Down the Amazon another book from the shelves. This subject of this book is actually much more interesting than he seems. Normally these are fairly well-off white kids bumming around. (I have no quarrel with that; it's just standard in the genre.) This guy is the son of two of the jailed members of the Weather Underground, raised by Bill Ayres & family. As such, his persp Another serendipitous find when picking up River of Darkness: Francisco Orellana's Legendary Voyage of Death and Discovery Down the Amazon another book from the shelves. This subject of this book is actually much more interesting than he seems. Normally these are fairly well-off white kids bumming around. (I have no quarrel with that; it's just standard in the genre.) This guy is the son of two of the jailed members of the Weather Underground, raised by Bill Ayres & family. As such, his perspective is a very refreshing take on what's going on - he makes an effort to connect with people of all classes. It actually starts fairly conventionally - he goes off to studying Spanish in central America, and can't really communicate concepts to his host family because his Spanish isn't very good. But he then gets to more political things - his experience being a study abroad student in Chile during 9/11 was quite interesting. He also eventually works in the Chavez administration as a translator and travels to displaced communities in Colombia with his adopted mother and other social justice workers. It was fascinating stuff. I did my own Latin American stint, but things have clearly changed since I was there, and that was great. His first-hand reports on the things he did were so different from the established narrative it makes me even more skeptical of American media than I was. Boudin is truly fascinated with Latin America, & it was fun to accompany him on his journeys by reading this book. As an editor, I would have liked not having to notice quite so many dangling modifiers--they became more common toward the end of the book. And there were a few errors of fact that I noticed in the chapter on Colombia. The most glaring one: regarding "the people of Cacarica," "many of their ancestors had settled the Chocó well before the arrival of the Spanish colonizers." Not po Boudin is truly fascinated with Latin America, & it was fun to accompany him on his journeys by reading this book. As an editor, I would have liked not having to notice quite so many dangling modifiers--they became more common toward the end of the book. And there were a few errors of fact that I noticed in the chapter on Colombia. The most glaring one: regarding "the people of Cacarica," "many of their ancestors had settled the Chocó well before the arrival of the Spanish colonizers." Not possible, since the Cacarica community is mostly Afro-Colombian. Mejor dicho, it's true only in the measure that it's true of Colombia's people overall, as most have some indigenous ancestry. It's not surprising that such mistakes were crop up in that chapter, though, as it (as opposed to others) is based on just one short trip with an international delegation. This was a very interesting book about a young man's travels in Latin America (beginning as a foreign exchange student in high school), and how his worldview changed as he lived outside the United States. Chesa becomes interested in politics, and as he graduates from high school and then college, he takes different jobs in Latin American countries that help him understand the politics and culture. Like most Americans, I'm fairly ignorant about what goes on outside my country's borders (seriously This was a very interesting book about a young man's travels in Latin America (beginning as a foreign exchange student in high school), and how his worldview changed as he lived outside the United States. Chesa becomes interested in politics, and as he graduates from high school and then college, he takes different jobs in Latin American countries that help him understand the politics and culture. Like most Americans, I'm fairly ignorant about what goes on outside my country's borders (seriously, when was the last time you heard a news story on CNN about anything outside the United States, except for natural disasters?) so this was very eye-opening for me. I really enjoyed this book. One of the quotes in this book did such an excellent job at describing how I feel about traveling that I kept it. "somewhere along the dust-chocked Guatemalan road between...and ...was where I confirmed that I preferred traveling around the slow, bone-rattling way: by bus,with ordinary people. The bus we were riding in had been repainted in bright reds. The inside was colorful too: the seats had springs popping out of the upholstery, and the floor was caked with dirt a I really enjoyed this book. One of the quotes in this book did such an excellent job at describing how I feel about traveling that I kept it. I give it a 2.5. Chesa came of age with a backdrop of Latina America to guide him but I don't think he tells a story very well. I thought his attempt to engage indigenous people about the government and their educating him on what aspect of politics they know and what they feel actually affects their livelihood was the most interesting part but he didn't explore that enough. He also didn't give enough credit to the history of all of his parents, their views and the privileges he received both due I give it a 2.5. This review has been hidden because it contains spoilers. To view it, click here. He's really lucky to have been traveling in these countries during this period. So many exciting political events occur during his visits. I wish this personal travelogue felt little more personal. In writing about his experiences, I think he intellectualizes his time there more than he realizes. You can tell that he is likeable and fun but I sense that, as a generally private person, he seems to have trouble handing over those juicy, intimate details off of which a good memoir feeds. I did find He's really lucky to have been traveling in these countries during this period. So many exciting political events occur during his visits. I wish this personal travelogue felt little more personal. In writing about his experiences, I think he intellectualizes his time there more than he realizes. You can tell that he is likeable and fun but I sense that, as a generally private person, he seems to have trouble handing over those juicy, intimate details off of which a good memoir feeds. Chesa's a buddy of mine, so I was excited to read his book - a travelogue / coming of age story about his many trips throughout South/Central America. The book was easy to read, and the stories were unique and filled with interesting personal details. The writing is thoughtful, and you can feel the author's love of his subject(s). Chesa clearly knows a lot about the history and politics of the region, and has thought a lot about his [very radical:] views on U.S.-Latin American relations. And whi Chesa's a buddy of mine, so I was excited to read his book - a travelogue / coming of age story about his many trips throughout South/Central America. The book was easy to read, and the stories were unique and filled with interesting personal details. The writing is thoughtful, and you can feel the author's love of his subject(s). Chesa clearly knows a lot about the history and politics of the region, and has thought a lot about his [very radical:] views on U.S.-Latin American relations. And while I'm not sure I agree with them, it was refreshing to get a very different viewpoint. Boudin had my ear for the first couple chapters...I love food, chicken buses, and language faux pas. I even wanted to meet this author and swap stories. However, when Boudin tried to get serious about the struggles of life and politics in Latin America, he came out sounding repetitive at best, disingenuous at worst. He did not delve deep enough into the root issues; rather, he followed the party line and spouted leftist political theory with few words used for reflection. Latin America is far to Boudin had my ear for the first couple chapters...I love food, chicken buses, and language faux pas. I even wanted to meet this author and swap stories. However, when Boudin tried to get serious about the struggles of life and politics in Latin America, he came out sounding repetitive at best, disingenuous at worst. He did not delve deep enough into the root issues; rather, he followed the party line and spouted leftist political theory with few words used for reflection. Latin America is far too complicated for outsiders, or gringos (which we will forever be), to promote one viewpoint without acknowledging that the citizens of the region are divided in their opinions. I really liked this book. Though it was a 'hard' read because of all the facts and political jargon, I found it insanely interesting. Having traveled through some of Latin America myself it helped me to put a lot of the recent history into context. Loved reading about his opinion on Venezuela. Wish there were more thought-provoking, truthful books out there like this one. this is an extraordinary book because it allows you to see and feel that other world that is latinamerica. Chesa Boudin's clear language and keen observation are a window into an inspiring time in south america. As a latinamerican I have tried to explain my culture to my US friends and know I wasn't getting through, here is someone who explains it wonderfully. From the cover and the blurbs I had no idea this was going to be a political essay. The history on the Latin American countries was useful and sometimes interesting, but the politics were far too slanted for my tastes. Wasn't super keen on the writing style, but I'm a sucker for Latin American travelogues. The political history combined with the perspective on present day leftist revolutions on the continent more or less overshadowed the less than stellar writing. I enjoyed the book and found it engrossing, though perhaps a bit too simplistic in its political views. The author is earnest and transparent about conflicts in his philosophy and his travels. A good travel book for the left side of South America. Doctrinaire leftists are rarely as naive as this young man. I slowly realized in the course of the book that he actually believes in the pablum he was fed by his surrogate father, Bill Ayers. I am boy. I travel Latin America. if you are into latin american politics or want to lear more about L.A./S.A. politics......some juicy travel stories. Chesa Boudin is very reflexive. He thinks deeply about his actions and their consequences. Very interesting book to get a sense of how recent events have shaped Latin America. Not very well written, this guy thinks he's the first one to notice the nuances of Latin America. Overly leftist and cannot see that everything is not black and white. Sort of a snore fest. I loved this book, I found it really interesting especially after I visited Guatemala. He shows you a whole new side of South American and a new perspective on their government and politics.